Partnership begins revisions to trifold disciplinary charts, Spring 2017 Academic Transition Initiative meetings, Meet the UW College Education Partnership School Facilitators, and more! Links to Partnership newsletters, from May, 2007, to the present. The Partnership impact map defines the geographic scope of our members and events and is updated yearly. This yearly flyer lists the various Partnership activities and events made possible by annual membership dues. Director, Audrey Kleinsasser, presented this poster at the annual meeting of the American Association of Colleges and Universities, February 23-25, 2012, New Orleans, LA. 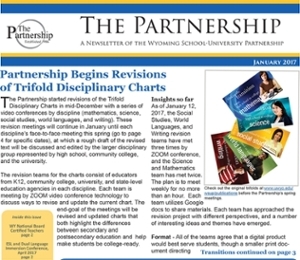 This document explains the governance of the Wyoming School-University Partnership. These course comparison charts display the differences between high school and college course expectations. The goal of these documents is to help teachers, parents, and students develop a realistic idea of how a post-secondary experience will vary from high school, and prepare students better for this transition. The charts were created by the Wyoming Education Coordinating Council (formerly the Wyoming P-16 Education Council) and the Wyoming School-University Partnership in 2009. In the fall of 2016, the Partnership has begun revising and re-visioning the documents. These publications seek to improve your understanding of the Wyoming School-University Partnership. Please contact the Partnership if you have any questions or would like hard-copies of any of the publications.